This week we cleaned a beautiful Cactus Fibre Rug. This was a first for us, so testing and choosing the correct method for the rug cleaning was of the upmost importance. The fibre was very strong and hardwearing, very much like a Navajo or Kilim flatwave style rug. Thankfully, after thoroughly testing the colours, they proved to be very stable, therefore we were confident that a mild shampoo and soft brushing cleaning system, with a fresh water rinse, was the best way forward. The only risk with this system, as with many types of flat weave rugs, is the corners of the rug can curl when they get wet. We would overcome this by hanging and rapid drying the rug once cleaned. If that didn’t work, we would lay it on an air bed in the opposite direction to flatten the corners. After gentle beating/dusting and vacuuming we proceeded with the suggested system, keeping a close eye for anything unexpected. The rug cleaned extremely well, so next the priority was to the dry the rug as quickly as possible. For this we used Rapid Dry Airmovers and de-humidifiers with the rug hung on a beam to reduce the risk of the corners curling. After a few hours we had a completely dry rug, we then post checked, vacuumed and left the rug ready to be returned to the client. We do very much enjoy unusual and challenging rug cleaning, so if you have anything unusual, or you’re not sure about, give us a call. We will give you free, honest, helpful assessment and advice on whether we think we can help you or not. 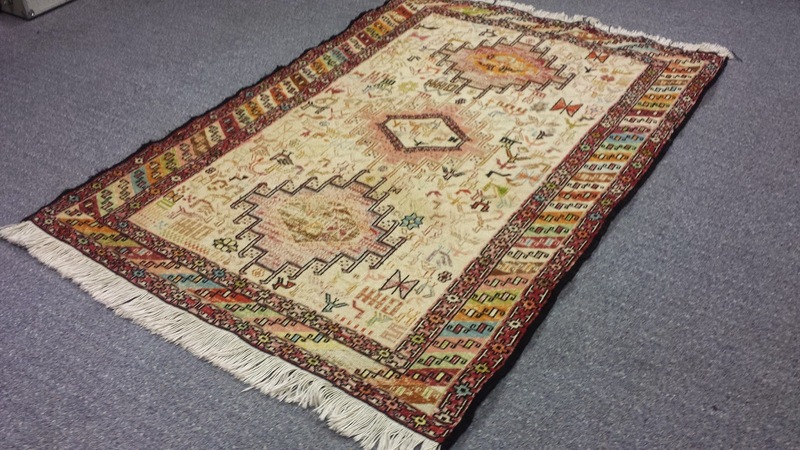 Go to http://www.hand-cleaned-rugs.com for more informations on our rug cleaning service. A new Team Member at Direct Cleaners!